In Pont-Château almost the complete CX-peloton gathered for the second last World Cup of this season. Gosse was selected once again by national coach Gerben de Knegt. 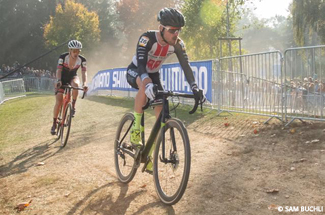 Gosse was on the hunt for some UCI-points, as he is almost entering the top-50 of the rankings. On a fast track in France Gosse had a flat tire in the first lap. He lost a lot of places, but was up to place 30 halfway the race. After another flat in the 6th lap, Gosse had to chase again. He managed to gain some positions, but again had to change bikes after he felt his tire was slowly losing air. Eventually he finished on a 33rd spot after almost 1 hour and 8 minutes of hard racing. Wout Van Aert took the win, Toon Aerts and Michael Vanthourenhout made it a complete Belgian podium today.